A few years ago, while riding a particularly steep escalator out of a Melbourne city train station, I was overcome with a crippling anxiety. My breath quickened, my heart started to pound, my legs began to quiver and I had the overwhelming feeling I was about to topple over backwards. Was I having a heart attack (I was 26 at the time – too young for that, surely); a panic attack (but what could I feel stricken by); some kind of weird X-Files-y alien takeover (possible, I guess)? Holding onto the railing with both hands, head down and breathing as deeply as I could manage, I made it to the concourse. What just happened?? The next morning, taking the same route, the same thing happened. It hit me like a ton of proverbial bricks: for some inexplicable reason, brought about by absolutely nothing, I had developed a fear of heights. Fast-forward two years and I’m off on a five-month overseas adventure, ticking things off my steadily growing bucket list: camping at a UK music festival (tick), eating rotten shark in an Icelandic hot spring (tick), windsurfing in Venezuela (tick). Next? 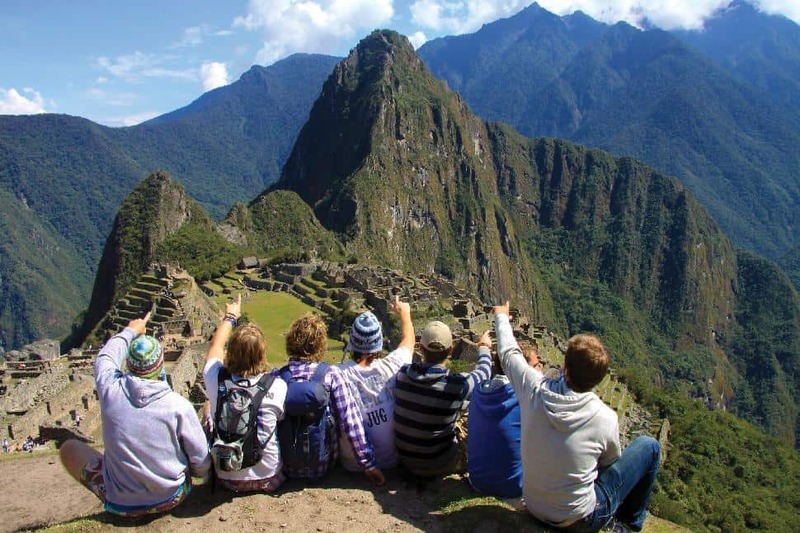 Hike the Inca Trail. I headed to a Toronto travel agent and booked myself onto an Intrepid trip to Peru. 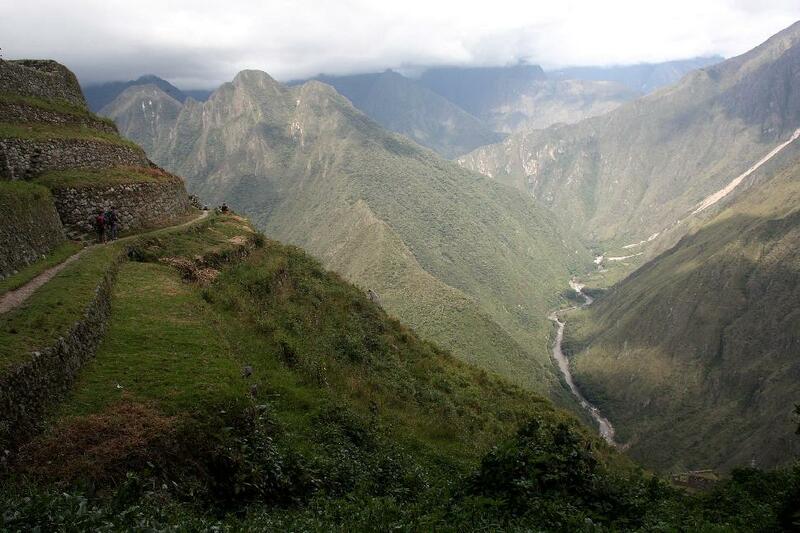 Inca Trail - that's gotta be a walk in the park! I was still pretty green about the world at this point. What concerned me more than anything about the trek was whether or not there would be toilets along the trail (there are). It didn’t even occur to me that the trail might be completely terrifying to anyone with even a vague sense of vertigo – in my mind, the Incas had dragged massive slabs of granite along a flat and gently winding trail in order to construct Machu Picchu. No way would they have been traversing up, down and around any steep mountains. The most preparation I’d done was Googling ‘Inca Trail fear of heights’, which came up roses. This was going to be a (literal) walk in the park. Except, of course, that it wasn’t, as anyone who knows anything about the world will tell you. But the higher we went, the more wobbly my legs got, until eventually I turned around and headed back down, slowly escorted by my partner-in-travel, Rich. When we got back to our hotel that night, I admitted to the rest of our group that I was a little scared of heights. More than a little, actually. Quite terrified. 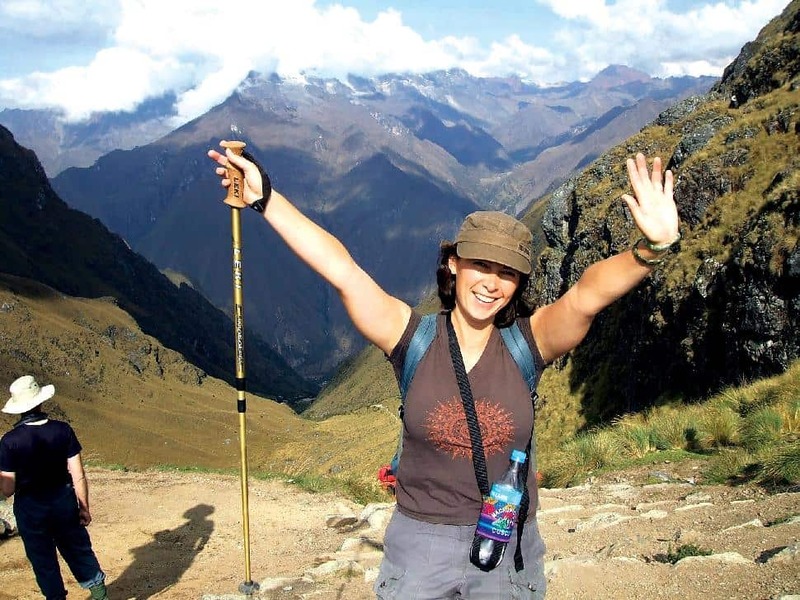 Carmel, a mother travelling with her husband and two kids, looked quite surprised and said, “Well, good on you for facing your fears and doing the Inca Trail. 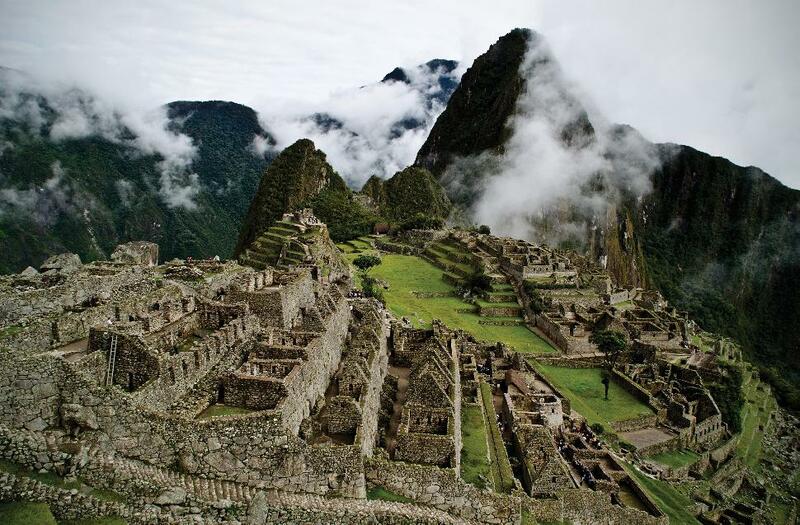 By the time we get to Machu Picchu you’ll be right as rain!”. I gulped audibly. We arrived at Kilometer 82 early the next day, along with a bunch of other hiking groups. Our guide handed out walking poles and we headed through the first checkpoint, got our passports stamped, and had our picture taken under the sign. This was it. We were doing it. The first few hours were beautiful, as we meandered along a gentle path through grassy plains, passing grazing donkeys and cacti and flowers. There was a steep climb up a wide set of steps (the lack of railings was a sign of things to come) and then a steep climb down the other side (manageable, and not too scary). In the afternoon, the path narrowed and steepened as we made our way through farmland and dense thickets of trees. Every so often a herd of llamas would pass, skittering nervously ahead of their shepherd (one joked “Taxi? Anyone call for a taxi?”). By the time we made it to camp that evening, everything was starting to hurt – legs, feet, lungs. On a fear of heights scale, day one had been manageable, but something (ie. the Internet) told me tomorrow would be much worse. After a pancake breakfast on day two, we had a quick briefing from our guide about what to expect. We were headed up to Dead Woman’s Pass. It was going to be hard. We were to take things at our own pace. There would be a lot of steps and we would be going up very, VERY high. It would be hard to breathe. We had to chew coca leaves (it helps with the altitude), drink plenty of water and take rest stops. Off we went. Sometimes the path was steep and rocky. Sometimes it had steps which were small and narrow, like they’d been paved for a gnome; sometimes the steps were high and deep, like they’d been laid for an elephant. As I huffed and puffed through moss-covered trees and spindly bushes, the porters rushed past, their backs laden with our belongings. Those guys are machines. The higher we went, the harder it got; you could feel the air getting thinner with each step you took. After more than an hour of shuffling along at a pensioners pace, we finally made it to the peak. Despite an altitude of 4,125 metres, I was fine with the height here – vertigo, be damned! At the dawn of day three, I was feeling pretty good about life. The sun was shining, birds were singing and I had yet to experience any crippling bouts of wobbly legs or feel the need to crawl across difficult parts of the trail. Little did I know that today was the day I’d – cue the dramatic music – come face-to-face with my fear of heights. The path out of camp was a steep gravel slope up the side of a mountain. For the most part, the ‘drop’ side was tree-lined, so you couldn’t see just how high up you were. But every so often the trees would clear and you’d be faced with a sheer plummet. I rounded one corner to see a wood-slat bridge – less than a metre wide – nailed into the side of the cliff. With no rail. The only thing between the bridge and a drop of what seemed like 60,000 metres was… nothing. That’s when it started. My legs and feet locked. My palms started to sweat and my head began to swim. Rich crossed the bridge in front of me, then turned around and gently coaxed me across. “Don’t look down”, he said. “Hold my hand and just walk”. After a minute or so of deep breaths, my legs started moving and I crossed. Surely that would be the worst of it. No. The rest of the day was filled with similar scenes: heights, drops and steps leading into nothing. I was not feeling good. In addition to jelly legs, I had also developed a pretty nasty stomach bug, which saw my pace rival that of a snail’s. Various members of our group, Rich and our guide slowly led me down the Gringo Killer steps (gulp), along a steep gravel path, and into our camp for the evening. That night, I sipped on soup, tea and dehydration salts in our dinner tent, cried with gratitude to the porters, new travel pals and our guide for helping me out, and gradually came good. We fell into our tents early that night, in preparation for our 3.30 a.m. wake up call for the last day on the trail. The next morning, with guts feeling relatively back to normal, we marched out of camp with around 250 other campers. After a quick pause at the final checkpoint, we were almost there. There were still quite a few precarious stretches: a narrow gravel path about 10 metres long, with nothing between you and the valley below (deep breaths and a firm grip on Rich’s hand got me across), and a hairy ascent up the steep Monkey Steps – which you have to climb like a ladder – on the way to the Sun Gate. Two Argentinean hikers held my walking poles as we scrambled to the top; we high-fived and clapped each other on the backs, me saying “Good job, guys!”, them laughing and exclaiming “Muy bueno!”. Arriving at Inti Punku just as the sun was rising above the mountains was one of the greatest feelings of my life. The view down to Machu Picchu was perfect and beautiful. We had conquered a mountain. I had scrunched up my eyes in the face of my fears, but had persevered anyway. I’m kind of grateful for my ignorance about what the Inca Trail would involve. If I’d known how challenging it would be, I don’t think I would have done it. But when you’re part of a group, everyone’s got your back, quite literally. On those steep narrow trails, people held my hand and held me in their arms when I felt shaky and sick; when Carmel’s husband fell ill at the end of day one, I took him cups of hot tea; when the fearless 20-something Dutch student sprained his knee, we all took it in turns to carry his backpack and help him down rocky steps; when our porters jogged past us, red-faced and sweaty, I gave them boiled lollies and rounds of applause. On this kind of adventure, your group becomes your family, and you’re all in it together. 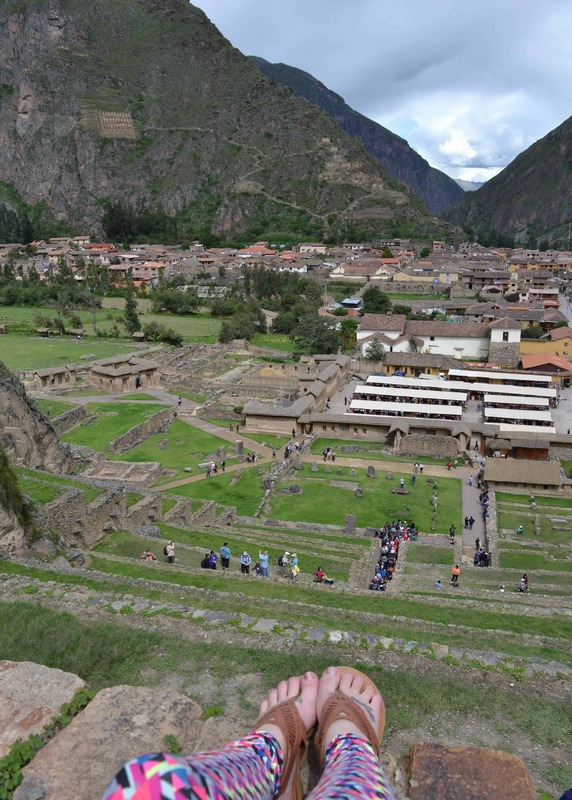 It’s a cliché, but after conquering the Inca Trail, I think I can conquer just about anything. Except, perhaps, that steep escalator in Melbourne.